Class actions, collective actions and multi-plaintiff actions are a regular part of life for employers throughout the United States. 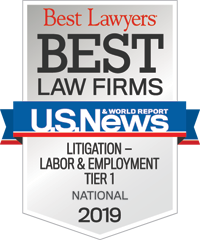 Plaintiffs’ attorneys and government agencies have revived interest in these complex actions in employment cases in recent years and have brought to the process a renewed vigor and resourcefulness. Large, complex class actions can quickly become “bet-the-company” scenarios. While the costs alone can be staggering, high-profile cases can also have a significant impact on a company’s reputation, morale and operations. When your company’s life may be on the line, Constangy offers a team of attorneys that understands the potential legal and unique business ramifications you face – and one that can develop and execute an effective defense strategy to protect your interests. We are elite strategists, adept practitioners, and down-to-earth partners in working through competing priorities necessary to resolve complex matters. Planning and operating within a litigation budget. Constangy's Class Action practice group is experienced in all forms of multi-plaintiff and other representational employment claims including class and collective actions. We regularly defend class and collective claims brought by private litigants and the government throughout the United States under Title VII of the Civil Rights Act of 1964 (Title VII); the Fair Labor Standards Act (FLSA); the Age Discrimination in Employment Act (ADEA); Employee Retirement Income Security Act (ERISA); the Americans With Disabilities Act (ADA); the Worker Adjustment and Retraining Notification Act (“WARN”); the Racketeer Influenced and Corrupt Organizations Act (“RICO”); the Fair Credit Reporting Act (FCRA); and their state law counterparts. Prevailed on a motion to dismiss a claim that student athletes are employees of their schools. Obtained preliminary injunction against the United States Department of Labor and ultimately summary judgment against a labor union on behalf of trade association and twenty of its members nation-wide. In a case involving potential exposure of $20 million to our clients (and more than $300 million to the industry as a whole), we successfully challenged a rule issued by the United States Department of Labor relating to agricultural workers. Summary judgment decision was affirmed by the United States Court of Appeals for the Fourth Circuit. Defeated class certification on many occasions, including multi-million-dollar class actions under federal and state wage and hour laws involving allegations of off-the-clock work, falsification of time records by management, exempt misclassifications, and meal and rest breaks. Defeated collective action status in a multi-million-dollar collective action under the Fair Labor Standards Act, then settled the case with two named plaintiffs for nuisance amount. Obtained summary judgment on all issues in an Equal Pay Act and Title VII wage discrimination case that was filed as nationwide class action. Obtained summary judgment in a multi-million-dollar RICO class action, which was affirmed by the United States Court of Appeals for the Eleventh Circuit. Managed three large cases involving a major U.S. employer: an FLSA case involving 29 plaintiffs; another FLSA case involving 50 named plaintiffs and a notice to be issued to more than 500, and; an ADEA case with 15 named plaintiffs and seeking nationwide collective notice. Handled litigation on behalf of big-box and specialty retailers throughout the country dealing with multi-plaintiff and class litigation. Obtained early dismissal of a large Fair Credit Reporting Act class action. Employment law changes will be coming with the Trump Administration: What should employers expect? Do arbitration agreements have to comply with the OWBPA? Employers, just say no to these disability/pregnancy practices! Is arbitration a good fit for your company?